Welcome to the new and improved website for Skweeky Kleen. The site has been completely restructured and harnesses the latest in website design – from ‘sticky’ menu bars through to an embedded video loop. The site is not only visually more appealing but will also be easier for customers to access. “Our innovative use of technology has enabled Skweeky Kleen to become market leaders in the cleaning industry. This includes investing in the latest cleaning equipment through to the development of a bespoke quality management system. 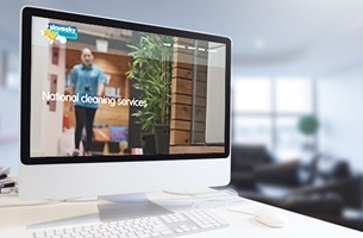 It was important that our website reflected our professional approach to managing and delivering commercial cleaning contracts. I’m delighted with the result.” Feedback on the new website has been very positive, and this is backed up with strong google analytic results. The Skweeky Kleen team is already building on this early success with the development of an animated infographic on the company’s quality management system, Kore.